Yeah baby! It’s a 2008 Honda Accord LX-S Coupe. I’ve been waiting for this car to hit the showroom floor since I first saw photos of the concept vehicle at the auto shows last year. In my opinion, it’s one of the best looking automobiles on the market today, and you can get them for around $21,000. Mine’s a base model four-cylinder with 190 hp. Any more horsepower and I’d be getting speeding tickets right and left. Now I’ll just be getting them left. The navigation system, leather seats, moonroof and XM radio push the price closer to $30,000, so I went with the base model and certainly haven’t been disappointed with what I got for the money. Vehicle stability control, dynamic braking, drive-by-wire throttle, side curtain airbags, active head restraint, active noise cancellation (yes, aviators, you read that right — an ANR system for the entire car! ), 17″ wheels, cruise control, tire pressure monitoring system, 6 disc CD changer, automatic transmission, power windows/doors, remote keyless entry, heated windows. Hell, I was excited just to have power steering. The buying experience was not exactly painless, but it wasn’t as bad as it could have been. I have the internet to thank for that. These days you’d be crazy to deal with a retail salesman; get internet quotes via the web and ensure you work with the internet department at the dealership. That’s what I did, and my negotiations started off at invoice price. Keep in mind this is on a new model, too. The 2008 Accord is completely redesigned, so I was going after a brand new generation, not some design which has been around for years. This is a relatively hot item. I don’t begrudge the dealership making a few dollars, but the spread between invoice and MSRP was about $2500. There’s no way I was going to wade through that chasm. The worst part about the buying experience was dealing with the exasperating finance person. You think you’re done with the sales department and they hand you off to a smiling person who is ostensibly not a salesman. Yet before you know it this guy — who is supposed to be getting your paperwork in order — is trying to sell you an alarm system, Lojack, extended warranties, and more. I said no to each and every item. If you look closely at the terms of the extended warranties, they usually exclude most of the big ticket items. Timing belts, catalytic converters, exhaust systems, etc. And none of them cover preventative maintenance, so you’d be lucky to get any coverage at all in the event of car trouble. Plus, if you don’t keep the car in tip-top shape, they’ll deny your claim right off the bat. I know this because I actually read the warranty! When I asked the finance guru if he’d mind my doing that, the look on his face told me I was the first one that had ever asked to read the thing. How sad is that? They do their best to confuse you with semantics. “Oh, this is a six year warranty!” Uh, no it’s not. The factory bumper-to-bumper warranty covers me for the first three years, so it’s really only a three year extension of the already-included warranty. And the powertrain is warrantied for five years, so it’s only a one year addition there. And then only on items for which the warranty administrator (aka not you) approves coverage. All this for only $1800! No thanks. I couldn’t help but laugh at how the salesman insisted Hondas are the epitome of reliability, yet the guy trying to sell the warranty will scare you with tales of expensive computer components which are sure to fail. Which is it guys? Is this a reliable car or isn’t it? Anyway, I arrived at the dealership around 12:30 p.m. It was 6:30 p.m. and completely dark by the time I drove away from the Honda dealership. As my trusty 1993 Eclipse faded in the rear-view mirror of the shiny new Accord, I couldn’t help but feel sad about leaving my old friend behind. The most surprising thing about the car buying experience was how incredibly sad it was to say goodbye to the Eclipse That Would Not Die. As I unloaded my personal belongings from the old gal, I was thinking about all the adventures we’d seen together. Sliding sideways into snow drifts while skating down Mammoth Mountain. Road trips to Las Vegas. Shuttling students back and forth at the airport. Literally thousands of trips to/from various rehearsals and performances all over Southern California. The marathon runs to Hollywood. When I bought the Eclipse, the world was a different place. For one thing, we’d just elected a new president, some guy named Clinton. There was no World Wide Web. Most people didn’t have email, and only a few had cell phones. It was 1993, and I was still in college. The $10,000 cost of the car seemed enormous. How would I ever pay that off? Over the past few years, the age of my Eclipse became somewhat of a joke, even to me. I think it was hard to let it go because it marks the end of an era. I’m not sure what that era is, but there’s no denying a lot of memories are wrapped up in that vehicle. I kept the car washed, waxed, and maintained for 15 years. And now it’s going to end up being crushed by some guy named Joe at a junk yard. How sad! I suppose I’ll one day feel that way about the Accord. If I get the same life out of the Honda that I did from my old warhorse, I’ll be satisfied. Speaking of life, I snapped a photo of the odometer after unloading all my personal stuff from the car. 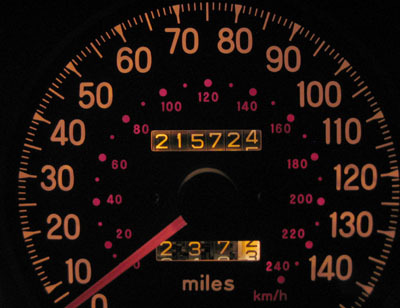 The final tally: 215,724 miles. The new car does have a lot of similarities to the old one. They are both base models. Both coupes. And both of them are red. In fact, every car I’ve ever owned has been red. I suppose I could have branched out with a new color, but the palette offered by most car manufacturers is just not very compelling. Most people seem to favor silver, gray, black, white, or some beige variation. Take a look around the parking lot next time you’re out and about. It’s a sea of non-descript bland looking vehicles! 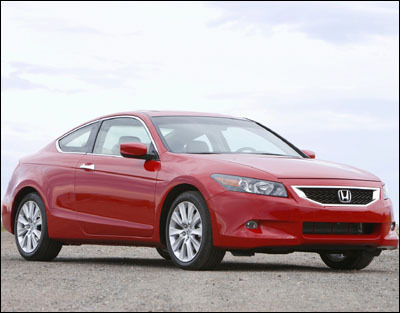 The only stand-out colors offered for the Accord coupe are blue and red, so there was really no choice to be made. I’m not driving a minivan here, folks. 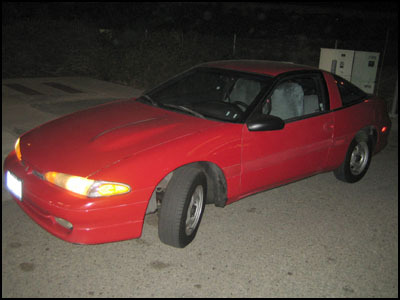 It’s a sporty coupe — it’s supposed to be red. 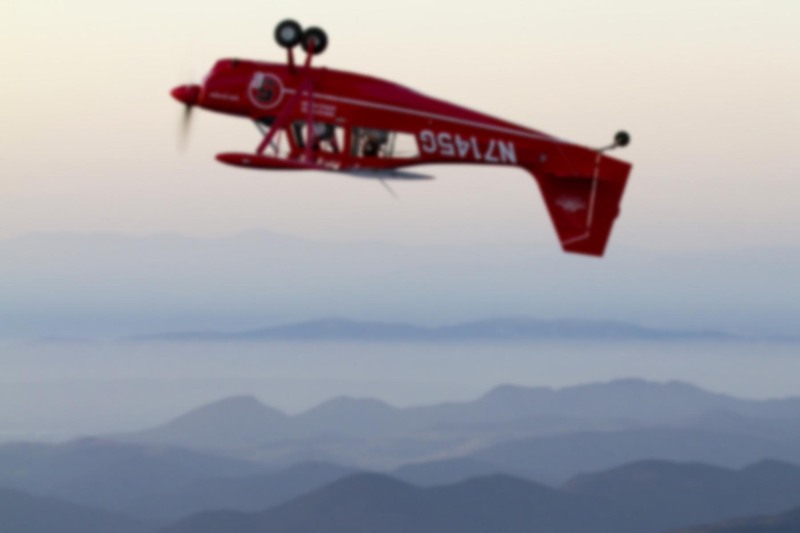 The coup de grâce was when I realized that the Pitts S-2B is the same color as the Accord. Now that’s just cool! I’m a little concerned about keeping the ivory interior clean, especially in light of the dirt and grease filled environments in which I work. Not to mention a hyper sensitivity to door dings and other road rash which can only come from buying a new vehicle. The saving grace is that most of the cars at SNA cost a lot more than mine. There are countless Bentleys, Rolls-Royces, Lamborghinis, Ferraris, and Aston Martins in the parking lot, so they’re probably more worried about my doors than I am about theirs. The Accord seems to be a hit everywhere I go. I’ve been stopped by pilots, sheriff deputies, car aficionados, and random folks on the street who just want to get a look it. People take photos of it at stop lights. The guy who tinted the windows asked if he could take some pictures for his web site. And just the other day, a woman came in to Gelson’s (a local grocery store) while I was there. She didn’t come in to shop, but just to say how much she liked the car and to ask who made it. Odd how we get attached to machines that do exactly what they were designed to do without fuss/bother/breaking, isn’t it? I’ve had the same experience with cars, and aircraft. The Honda looks great. I hope it serves you half as well as the Eclipse apparently did! You mean I will not be able to drive your car to the nearest “corner” to pick up the corner judges?? Bummer! 😉 Love your new car Ron. Just happened to stumble on your website and read the career instructor blog… so right!! Have fun at Borrego.